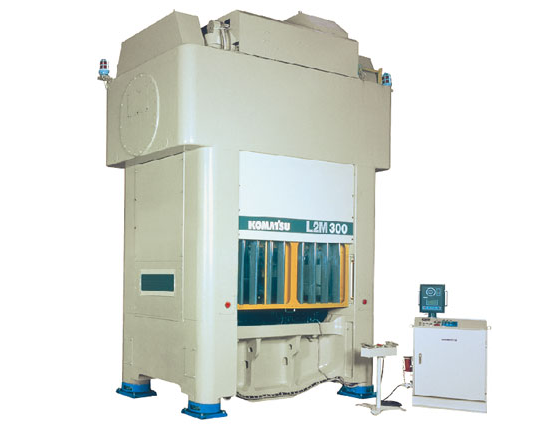 Progressive press with high rigidity and accuracy. We have thoroughly pursued high rigidity with a highly advanced mechanism. Its frame is of integral cast steel. With L2M/E2M200, noise and vibration on blanking have been significantly reduced with using the "cast steel frame." 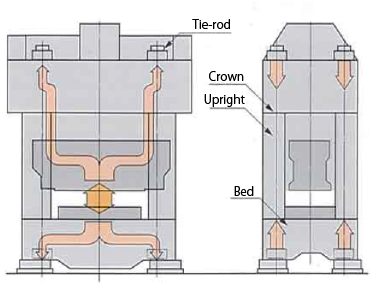 And high accuracy forming has been secured by high rigidity of no deformation structure using the "full tie rod structure" and the "front-rear-left-right symmetrical frame." In addition, they have the following features that improve rigidity and easy-to-use properties. 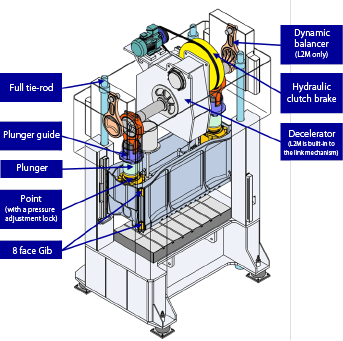 Slide inclination has been reduced and anti-eccentric load characteristics has been remarkably improved with the higher rigidity of slide drive and the wider point distance. Wide opening on sides easily allows progressive forming of wide coil. High rigidity "cast steel frame"
L2M series machines are equipped with the dynamic balancer (suspension) at an ideal location, which minimizes slide deformation by moving counter to the slide. They absorb thrust force and counter to eccentric load. Dynamic accuracy is maintained for a long time to support a longer die life. 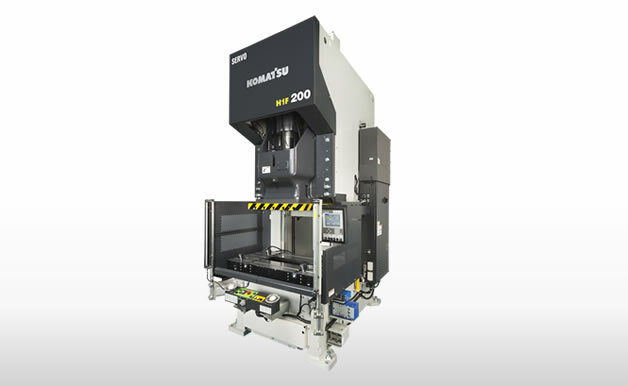 Emergency stop performance has been greatly improved by 40 percent than previous machines. Inching performance has been also improved for easier die adjustment on preparation. With a hydraulic driven lock nut structure, clearance on the point part can be made to nil. 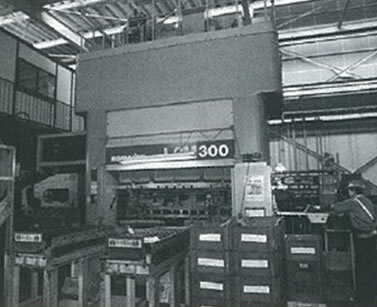 Since the clearance isn't expanded, high accuracy is maintained for a long time. 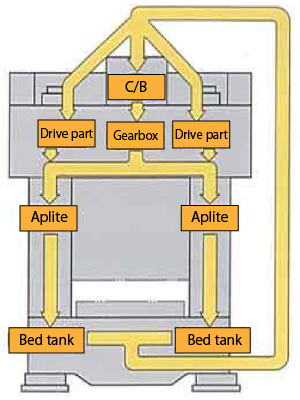 Lubrication oil heated in the drive system is circulated through the column to minimize die height variation by offsetting frame extension and drive extension to each other. We introduced Komatsu L2M300 of proudly high 100 SPM rotation, hoping we are to be more competitive. 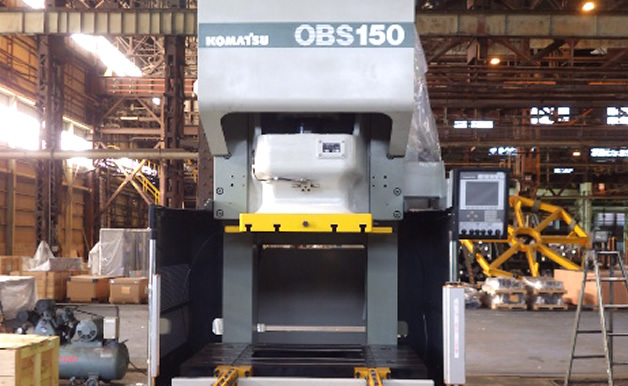 We really understand that the machine is not only highly productivity but also excellent in product accuracy. 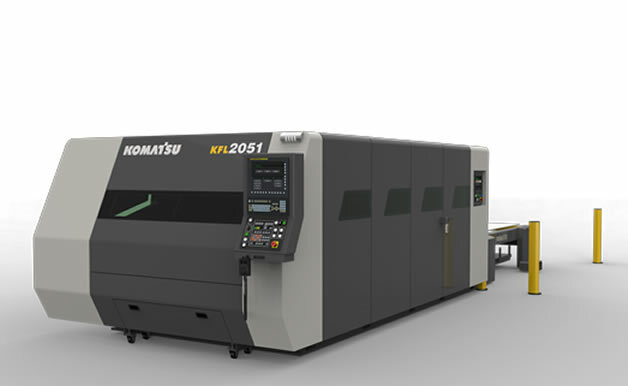 It is also superb in countermeasure against vibration and noise: Both vibration and noise were remarkably lower on Komatsu L2M with a die we had been using on other press. We introduced L2M hoping to get orders widely for automotive parts and others in addition to those for office equipment. With the link motion, we expect we can more flexibly cope with high tensile steel also.